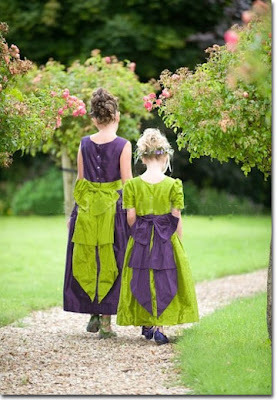 Our prize for the winner this challenge will be a chance to be Guest Designer at Colour Create. I've chosen to use some very old Claire's Cottage papers that I've had for ages but were the perfect colour combination for the challenge. My nestie die is from MFT and my butterfly punch is by Martha Stewart. The flowers are a combination of Wild Orchid Crafts and Magnolia and I've used one of my older Magnolia Images from a 2008 collection Tilda with Lilacs. Tilda has been coloured with copics and has a touch of stickles on her wings. This is gorgeous Sharon. 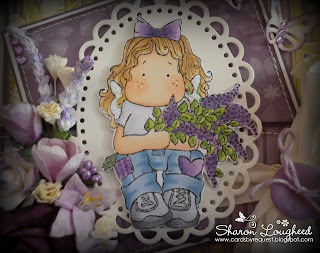 Love the colours and such a sweet stamp! 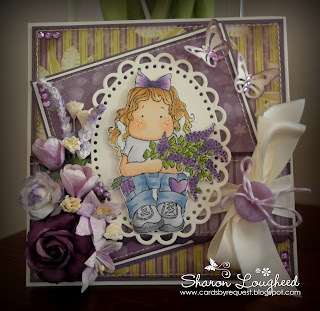 Such a stunning design Sharon, I love the colour combo and your layout looks fab. Thanks for joining us over at Totally Tilda, hope to see you again. And your flowers look stunning! What a beautiful card Sharon. This is so beautiful Sharon! this is so cute and adorable! wonderful image and magnificent colouring!